In 2018, Rosneft Oil Company provided an increase in reserves from exploration in the amount of 454 million tonnes of oil equivalent. The coefficient of replenishment of production with the increase in reserves according to the Russian classification was 138%. 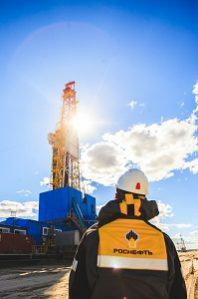 The Company has proved its leading position in exploration efficiency, providing consistently high reserve replacement ratio for many years. The improvement of reserve replacement efficiency is one of the key elements of the Rosneft-2022 Strategy. The Company has undertaken a commitment to replenish at least 100% of the hydrocarbons produced. The Company’s recoverable AB1C1 + B2C2 reserves amount to 19.4 billion tonnes of oil equivalent. Rosneft is the global leader among publicly-traded oil companies in terms of proven reserves life (5.6 btoe) and reserve replacement ratio. In 2018, successful exploration drilling rate onshore of the Russian Federation amounted to 84%. Exploration campaigns resulted in Rosneft’s discovering 23 fields and 230 new deposits with reserves of 250 mtoe. Its drilling penetration rate reached 341,000 metres; 142 exploratory well testing were completed. Over the past year, onshore of the Russian Federation, 5,500 linear kilometres of 3D seismic works were performed and more than 10,000 linear kilometres of 3D seismic works. The Company implemented large-scale seismic surveying in pivotal regions of its operation, such as Eastern Taimyr and Yakutia. Exploration and appraisal drilling will be performed upon the results of the processing and interpretation of the obtained data. The Company developed a set of research and experimental activities, and also is creating its own geophysical service. Rosneft’s geologists introduced modelling methods of field seismic survey works that allow determining optimal recording system for projects in Samara, Eastern Siberia and on Sakhalin Island. Together with BP, Rosneft is developing an innovative data recording system that has no equals in the world. This technology allows conducting seismic surveying while significantly reducing environmental impact. For the first time, 3D winter test activities were carried out at Ai-Yaunsky licence area in Western Siberia. As a result, geological sensitivity and capacity were significantly increased, and the explorability of the hard-to-reach area was proven. In 2018, the Company continued to process and interpret a significant amount of seismic data on offshore projects received in 2016-2017. Three successful field geological expeditions were conducted in the waters of the Pechora Sea, on Sakhalin Island, and in the Black Sea region of the Caucasus. Under license obligations, geological exploration in the areas of the Arctic and Far Eastern shelf and in the waters of the southern seas continues. Surveys were conducted at the site selected for drilling a prospecting well at West-Prinovozemelsky licence area in the Barents Sea. The results of the marine complex surveys provided data for well engineering in the licence area, including those for the provision of engineering and environmental protection. Detailed information on the soil constitution in the area will make it possible for the specialists to predict the development of geological and engineering processes, as well as to take into account the risks that may arise during drilling.